The relationship between mesothelioma and Simian virus 40 (SV40) is one that continues to be investigated. Some contend that SV40 infection can cause mesothelioma. Others have evidence that disputes this claim. The conflicting evidence suggests more research is needed. Mesothelioma is a rare cancer that usually develops in the lining of the lungs and its primary cause is asbestos exposure. SV40 is a virus that contaminated polio vaccines between the 1950s and 1960s. Although the SV40-contaminated vaccines were successful in reducing the incidence of polio, questions regarding its safety began to emerge shortly after its use. Simian virus 40 is a virus that was initially discovered in 1960 in rhesus monkey kidney cells. At the time, Dr. Jonas Salk’s and Dr. Albert Sabin’s polio vaccines were made from these cells and the mass immunization program for polio had already begun. From 1955 to 1963, an estimated 10 to 30 million people in the U.S. were inadvertently exposed to SV40-contaminated polio vaccinations. The exposure was so significant that researchers believe 80 to 90 percent of all U.S. children under the age of 20 had received at least one polio vaccination potentially contaminated with SV40 during those years. When 1961 reports indicated the injection of SV40 into hamsters could cause tumors, the U.S. government instituted a screening program requiring all new polio vaccinations to be free of SV40. However, vaccinations made prior to this regulation were not withdrawn from the mass immunization program and children continued to be exposed until 1963. In the early 1960s, researchers found SV40 had the ability to transform hamster and human cells to induce tumor formation. After the discovery of SV40-like DNA sequences in mesothelioma samples in 1994, investigators have continued to test the causal relationship between SV40 and malignant pleural mesothelioma. 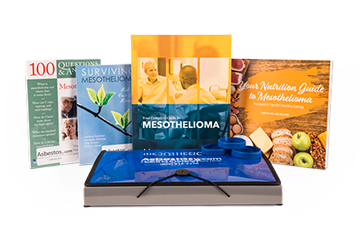 The amount of research that supports a causal relationship between mesothelioma and SV40 is significant enough to warrant concern. In animal testing, 100 percent of those injected with SV40 into the pleural space developed mesothelioma within three to six months. One study found that 60 percent of malignant mesothelioma cases in the U.S. contain SV40. While another study suggests 80 percent of cases contain the virus. In some studies, researchers have found human mesothelial cells to be uniquely susceptible to SV40, and have suggested that the virus and asbestos may act as co-carcinogens. SV40 has been detected in human tumors in more than 40 different laboratories and many of the reports from these labs say they found SV40 in mesothelioma tumors. Although there is evidence of SV40 acting as a causative agent in the development of mesothelioma, there is an equal amount of evidence arguing against this causal relationship. With the intent of resolving the conflicting information on mesothelioma and SV40, the International SV40 Working Group was formed in 1997. The group included the majority of laboratories studying SV40 in human tissues. In a study funded by the National Cancer Institute, nine laboratories agreed to participate in the study, which tested tissue samples for traces of SV40. Each laboratory was given a set of 25 human mesothelioma samples and 25 normal lung tissue samples. The samples were not labeled and each laboratory used their own method for detecting SV40. Results showed that none of the mesothelioma samples were consistently positive for SV40, suggesting a lack of evidence for a causal relationship between mesothelioma and SV40. Other studies showed similar results. In one evaluation of children born during the years that SV40-contaminated vaccinations were used, an overall difference in cancer incidence was not reported when comparing the group to children who received uncontaminated vaccinations. A 2011 study concluded exposure to SV40 is not enough to cause cancer on its own in humans, but that it might co-contribute to the development of cancer when a person is exposed to other carcinogens such as asbestos. For nearly every study that shows a lack of evidence for a causal relationship between cancer and SV40, another study exists that show a possible correlation. Considering the conflicting evidence, the medical community has yet to accept or reject a causal relationship between mesothelioma and SV40. Researchers continue to investigate the issue and they hope to reach a conclusion through future studies. Robinson, B. and Chahinian, P. (2002). Mesothelioma. Tallers Grafics Soler: UK.